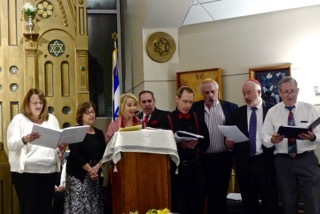 Congregation Kol Haverim has been well recognized as a talented music loving congregation. If music speaks to you and you feel called to express yourself musically and spiritually, you will feel at home in the Voice of Friendship Singers & Musicians. We are musically motivated congregants who enjoy collaborating in unique musical performances tailored to our own needs and preferences. We recognize that the powerful language that is music can be a superbly effective expression of worship, offering singers, musicians and the congregation alike moments of exquisite beauty, periodic opportunities for joyous participation in song, and the essential preservation of our treasured prayer modes and other musical traditions new and old. In addition, our meetings are truly "experiences in learning" and an opportunity to get to know our fellow congregants better. We have a tradition of performance at Holy Day, holiday, life cycle & special services, as well as collaborating in Jewish community events in the Greater Hartford area. Since our humble a Capella in beginning 1995 under the direction of cantorial soloist Tami Cherdack Sherman, we have a flexible rehearsal schedule to suit our busy vibrant congregation. We hope you will join us. For more information and upcoming rehearsal dates, please contact Cantorial Soloist Tami at Tamimusic@cox.net. Use goodsearch for your web searches. Each search will support Kol Haverim! a donation to Congregation Kol Haverim!